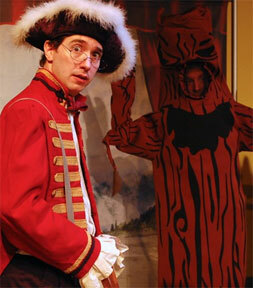 It's Ichabod Crane vs The Headless Horseman in this hilarious "spooktacular!" This adaptation is a great all-school show, blending the goofy and the spooky, with lots of interactivity for your students (and staff!). Not too scary for your kindergarteners, but still jokey enough for your middle-schoolers. Always popular with summer camps, libraries, and school Halloween assemblies, this is an ideal introduction to a famous American story and to the possibilities of live performance. Now available for year-round bookings! !